Anyone who has known me for more than a day or two will likely be aware of two things: waste disgusts me and Halloween is the end all, be all greatest holiday of them all. Although, to be fair the latter is hardly opinion, it is fact. And so, as we prepare costumes and travel plans and watch E run amuck in her amazing unicorn costume, a new recipe for those tired of the old standard roasted pumpkin seeds. With multiple pumpkins carved into Jack O’ Lanterns or roasted into homemade pumpkin pie, standard roasted seeds would’ve been running out of our ears. 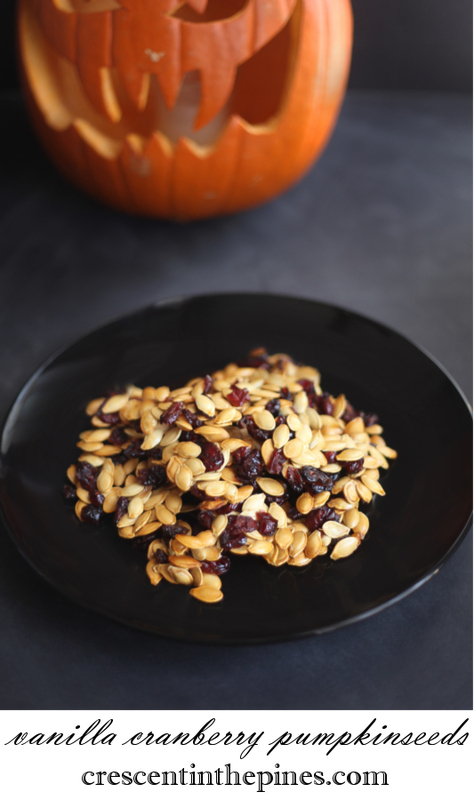 But this recipe, adapted from Wallflower Girl, plays the wholesomeness of roasted pumpkin seeds against the sweetness of honey and the tartness of dried cranberries. 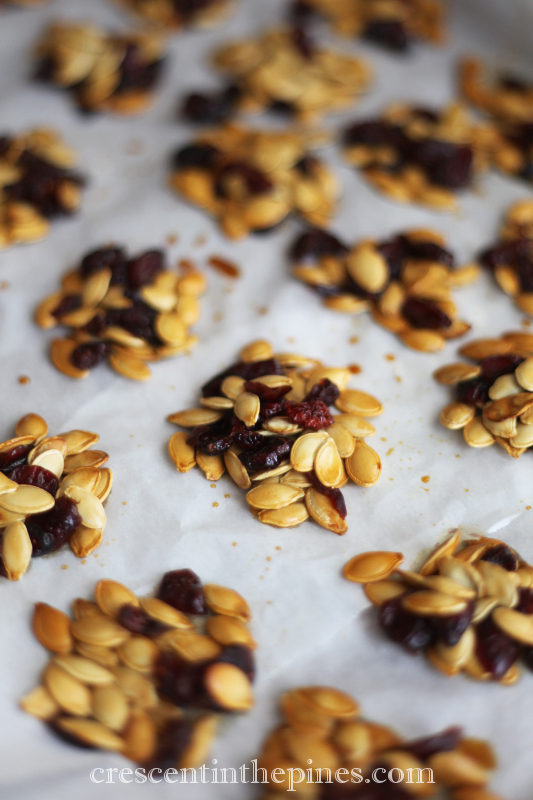 A delicious snack, it’s perfect for an overabundance of pumpkinseed. Preheat oven to 300°F. Stir together the honey, sugar, and vanilla extract in a large bowl to make a paste. Slowly add the boiling water just until the mixture becomes syrup like. 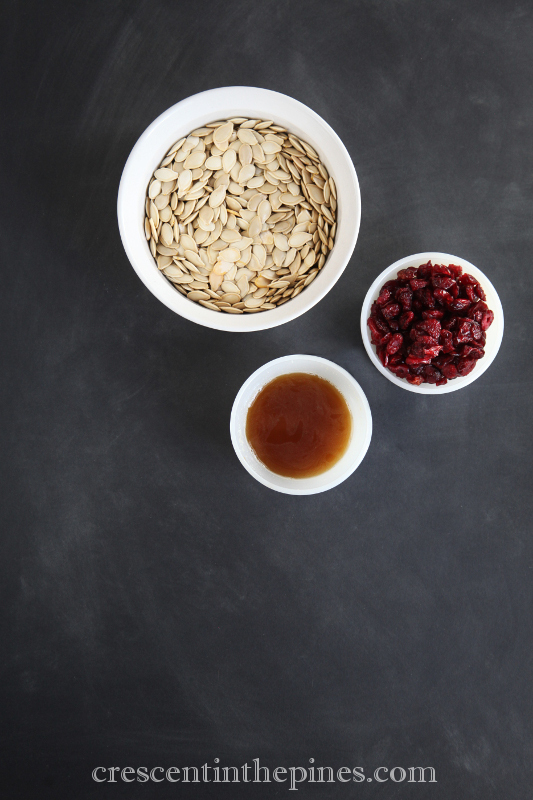 Pour the pumpkinseeds and cranberries (or choice of dried fruit) into the bowl, stirring constantly until they are completely coated in the sugar mixture. On a baking sheet lined with parchment paper, using a spoon drop the seed mixture in small clumps to make approximately 15-20 clusters. Bake 15-20 minutes until just golden brown. Cool before serving.